I don’t know how to begin to describe this book that I loved so much, I’d give it 10 stars if I could!! So I’ll just dive in, shall I? I loved, loved, loved this book! Anna McPartlin writes with such warmth, wit and empathy that you feel like you’re being enveloped in the outstretched arms of the Hayes clan. Mia ‘Rabbit’ Hayes is dying. In the end-stages of breast cancer, she’s been moved to a hospice to spend her final few days. She is leaving behind her adored daughter, Juliet, devastated parents, Molly and Jack, brother Davey and sister Grace. I know that sounds like wrist-slitting, depressing stuff, but it just so isn’t! Told through the differing perspectives of Rabbit, Juliet, Molly, Jack, Davey and Grace, and also giving insightful flashbacks from the love of Rabbit’s life, Johnny Faye, this is one of the most hilarious, delightful books I’ve ever read. I know I probably sound deranged! How can a book with such sad theme be even remotely enjoyable? But it is! The humour, the comedy, the absolute absurdity of it in the midst of such impossible sadness is spirited and heartfelt. The sheer Irishness of it all is just so unbelievably wonderful (which, to a fanatical wannabe Leprechaun like me, makes it even more worthwhile!). 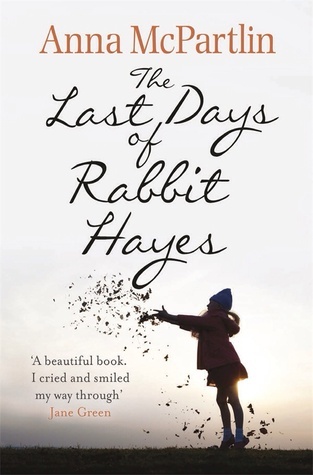 Through a series of flashbacks interspersed throughout the book, we learn about Rabbit’s life and how she has come to have such an incredible support system of extended family and friends who truly become part of the Hayes inner circle. Add to this the different hospice care-givers who drift in and out during Rabbit’s stay and you genuinely believe that there are some lovely people in the world who love and care with their entire being. I could ramble on for pages about each special, unique character in this book, but I’m not going to. You absolutely have to read it for yourself! It’s funny (actually laugh-out-loud hilarious in parts! ), uplifting, inspiring, and yes there is the inevitable sadness, but in the end it is a wholly satisfying story that will leave Rabbit Hayes embedded in your heart for ever more!